Product Type: Mounting Rail Kit. 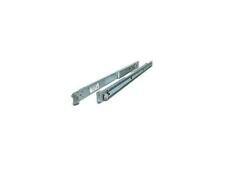 2U Premium quality rails with CMA support. All key characters will be legible. Pricing on grade “B” products will typically be lower than grade “A” products. We know you have more than one choice online, and we believe once you compare you will chooseWIDGETREE. Model: Tft5600 rkm. Part type: Rack mounted keyboard. Black sliding shelf for server racks. PART #: 36L8644. FRU : 36L8645. XSERIES 360. DON'T SEE WHAT YOU ARE LOOKING FOR?. ONLY WHAT IS PICTURED IS INCLUDED. DOA WARRANTY. P/N: 21P9704. 8686-2RX XSERIES. MODULE CADDY. ONLY WHAT IS PICTURED IS INCLUDED. DOA WARRANTY. Supermicro MCP-220-84605-0N Slim SATA DVD Kit w/ Bracket For SC846. Unless otherwise noted. THIS ITEM IS NEW, SEE NOTES. Local pick-up is FREE! No exceptions! Compatible Part Numbers: 0G302D, G302D, 0F238F, F238F, 0X968D, X968D. DELL PowerEdge T710. DELL PowerEdge T610. DELL PowerEdge R710. This is a great server disk caddy tray for Dell PowerEdge server. DELL PowerEdge R810. Cisco UCS C3260. Cisco UCSC-C3X60. Includes Screws. 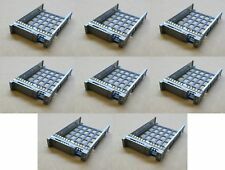 10x HPE 2.5" to 3.5" SFF to LFF SC Gen8 Gen9 Hot Plug Hard Drive Caddy 651314-001, 661914-001. 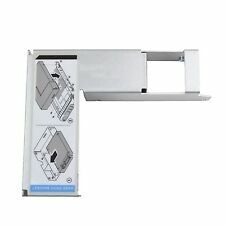 HPE 2.5" to 3.5" SFF to LFF SC Gen8 Gen9 Hot Plug Hard Drive Caddy. HPE, Dell, IBM, SUN Servers. HPE Server Options. Dell EqualLogic 146Gb 15K SAS Hot Plug Hard Drive With Caddy. In good condition and in full working order - Tested. Image shows only 1 x Caddy, but you will receive 6 caddys'. This BIN is for a quantity of. SL 76859 - 30 caddies and interp. LA 69452 -2 69720 -2 75782 -3 75747 -16 76522 -4 98796 -2. P 7202 i 220S 68936 -10 68938 -4 68939 -10. For all Dell PowerEdge servers and storage with 3.5" SCSI drive bayds. Firmware: XRCC. Dell EqualLogic 400Gb 10K SAS Hot Plug Hard Drive in Caddy. 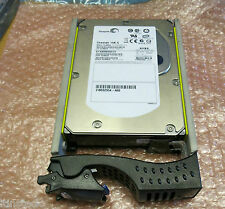 Dell 146Gb 15k Hot Swap SAS Hard Drive 3.5" with Caddy. For all Dell PowerEdge servers and PowerVault storage arrays with SAS. PowerEdge 2950 1950 6950 R900 R710 R610 MD1000 MD3000i and all other Dells with 3.5" SAS Drive bay. 0B22890 HUS154545VLS300. Part Number: 0B22890. 1 xNexSAN SataBeast 450Gb 15k SAS Hitachi Hard Drive HDD With Caddy/Rails. Capacity: 450Gb. Interface: SAS. LA 88937 - 32. FIBRECAT SX100-BASE(ID:YKNJ). FIBRECAT SX60-BASE (ID:YHAK YKCK) R. FIBRECAT SX80-BASE (ID:YHAL YKCL) R. FIBRECAT SX88-BASE(ID:YKCT) ROHS. HDD SATA 2TB 7,2K. For all Dell PowerEdge servers and PowerVault storage arrays with SAS. PowerEdge 2950 1950 6950 R900 R710 R610 MD1000 MD3000i and all other Dells with 3.5" SAS Drive bay. With 12 months warranty. Netapp Hitachi Ultrastar 300Gb 15k Fibre Channel Drive With Caddy. 1 x Netapp 300Gb 15k Hitachi Ultrastar Fibre Channel Hard Drive. Netapp P/N: 108-00156 B1. 1x Caddy P/N: 92328. DUP /w chassis with drives. For use with Dell PowerEdge 2950, 2900, 2850, 2800 etc servers. All Cisco UCS and UCSB Servers with 2.5" drive bays. Pulls From New Servers - with screws. Pn WR711 0WR711. Dell 146Gb 10k Hot Swap SAS Hard Drive 3.5" with Caddy. For all Dell PowerEdge servers and PowerVault storage arrays with SAS. PowerEdge 2950 1950 6950 R900 R710 R610 MD1000 MD3000i and all other Dells with 3.5" SAS Drive bay. All Cisco UCS and UCSB Servers with 2.5" drive bays. Pulls From New Servers -. Trending at $27.52eBay determines this price through a machine learned model of the product's sale prices within the last 90 days. 4 X 36GB 15k Sold as 1 Lot. 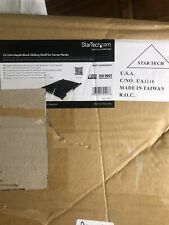 Item is used, Scratch or two which is what used item look, other wise ok.
HP Compaq Proliant Blank Hard Drive Caddy Hard Drive Filler - Free Shipping ! HP Compaq Proliant Blank Hard Drive Caddy - Hard Drive Filler. 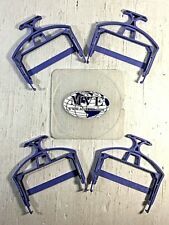 HP / Compaq Proliant hard drive blank caddies / Trays. Blank Hard drive filler trays 349460-001. · RX200 S1, S2, S3, S4, S5, S6. · TX150 S1, S2, S3, S4, S5, S6, S7. · TX200 S1, S2, S3, S4, S5, S6. · TX300 S1, S2, S3, S4, S5, S6. · TX600 S1, S2, S3. · TX100 S1, S2. · TX120 S1, S2. · RX300 S1, S2, S3, S4, S5, S6. DL380p Gen8. BL420c Gen8. BL460c Gen8. BL465c Gen8. BL660c Gen8. WS460c Gen8 Blade Workstation. DL160 Gen8. DL320e Gen8. P/N: 8FKXC. PowerEdge R430, R630, R730, R730XD. PowerEdge T430, T630. 1 SAS Tray Caddies. 4 Caddy Mounting Screws. NOTE:This Tray is for 2.5" HDD. ETA 3 to 8 busines. Brand Dell MPN Does Not Apply EAN Does not apply. Compatible Part Numbers: 0G302D, G302D, 0F238F, F238F, 0X968D, X968D. DELL PowerEdge T710. DELL PowerEdge T310. DELL PowerEdge T610. DELL PowerEdge T410. This is a great server disk caddy tray for Dell PowerEdge server. Part Number: 9W8C4, 09W8C4, Y004G, 0Y004G, 0N6RRK, N6RRK, F236H, 0F236H, WWGPK, 0WWGPK. R210, R310, R320, R410 , R415, R420, R430, R510 , R515, R520, R530, R610, R710, R720, R720xd, R730, R730xd. HDD Caddy Tray Carrier with the Part #. 42R4129, 42R4131, H87282. IBM eServer xSeries 3755. IBM eServer xSeries 3250. IBM eServer xSeries 306m. IBM eServer xSeries 3400. IBM eServer xSeries 3455. IBM eServer xSeries 3500. IBM eServer xSeries 3550.